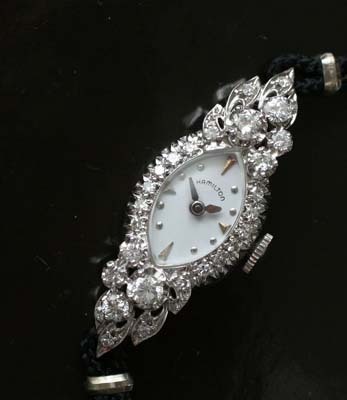 White gold and diamond cocktail watch. 14K white gold. A vintage masterpiece ! This ladies Hamilton is crafted in solid 14kt white gold and set with brilliant diamonds. The case is literally encrusted with diamonds, 26 in total! The diamonds are eye clean exceptionally white stones totaling about .75 carats. The lugs of the watch are angled downward for a more comfortable fit on the wrist. 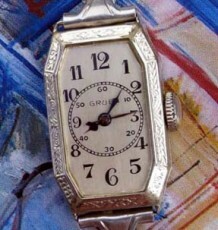 The restored dial features raised silver colored markers set against a white background with small dauphine hands for ease of reference. 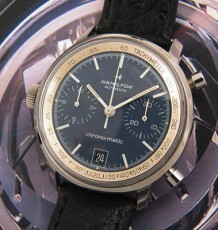 The watch is fitted with a Hamilton manual wind 17 jewel caliber 780, that is recently serviced and keeping great time. 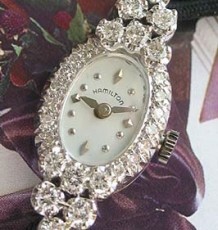 This is really a unique timepiece and a beautiful piece of jewellery. 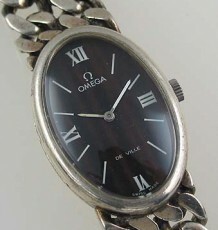 The watch measures 14.5 mm wide by 39 mm long and is supplied on a black cord strap.